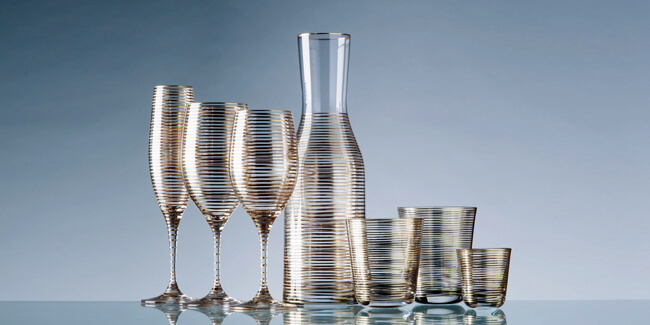 Timeless handblown glasses of lead crystal with artful touches, lovingly hand made and sanded in our glassworks . 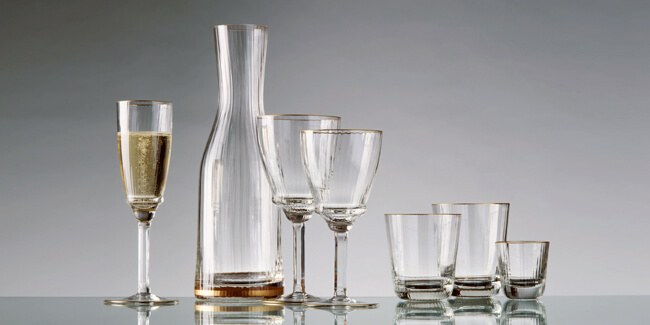 Here the traditional art of glassmaking art is maintained; great attention to detail and a rare commitment to the highest quality crystal glasses. 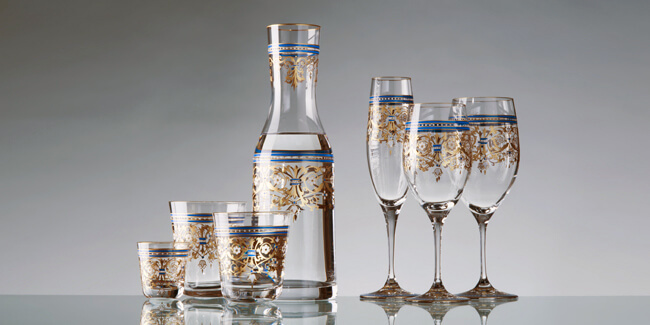 High quality lead crystal, skilled craftsmanship and traditional skills guarantee accuracy precision of cutting and harmony of shape to decorate your table and table. Discover another classic of OERTEL‘s collections! With its handsome, graceful silhouette and elaborate hand-cutting, the Rose Garden suite allows every table arrangement to achieve jewel-like status. The sparkling fine lead crystal is hand-cut to achieve a flower-form. “Rose Garden ” is the ultimate in elegant designs. A delicate hand-engraved decoration makes Papagena an extraordinary eye-catcher. 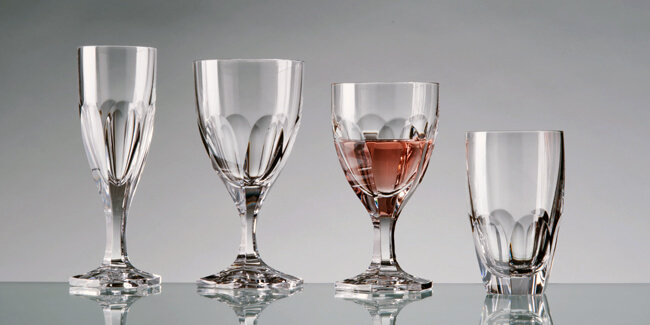 With loving craftsmanship and faithful detail, fine crystal glasses are finished with delicate exotic ornamentation. Discover OERTEL’s unique finish and technique, with Papagena. It was success in equipping sultans’ palaces, that provided the inspiration for Serail . This charming collection is created as a result of Oertel’s high-profile commissions by royal houses. Hand-painted ornaments in bright colours and real gold, swirl around the sensual fine contours of the noble crystal glasses and give the Serail series a haunting and exotic beauty. Sparkling, iridescent, glossy – mere words cannot do justice to “Aurora”. The elaborate hand painting gives the “Aurora” collection a unique quality. The decoration is made with real gold on brilliant crystal glass, and conjures up a memorable table setting with a glamorous visual effect. “Amelie” is a fine example of OERTELCRYSTAL’s unique status in the art of glass manufacture. 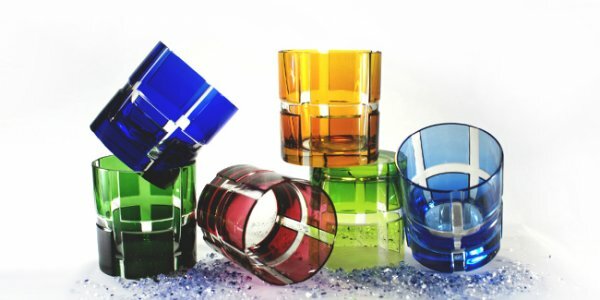 The optically- blown crystal glasses are hand-made by a complex procedure, known only to a few glassblowers in the world; it is an integral part of OERTELCRYSTAL’s craft tradition. The resulting dazzling effect makes each piece of the Amelie collection a rare and overwhelming beauty. 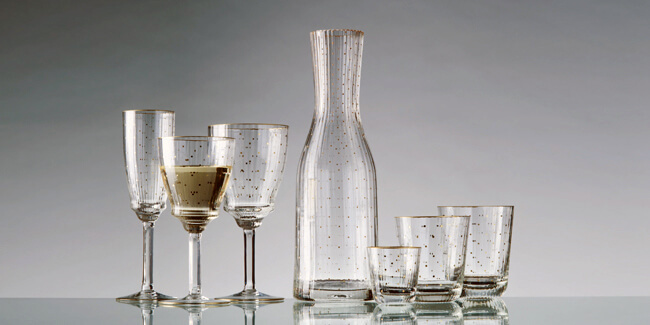 In the Stella collection, the beauty of Oertel‘s fine mouth-blown crystal is demonstrated by means of an additional decorative technique – “optical- bubbles” – and patterns. Our glass artists finish the blown crystal glasses with hand-painted gold dots, achieving a decor which is both refined and elegant. 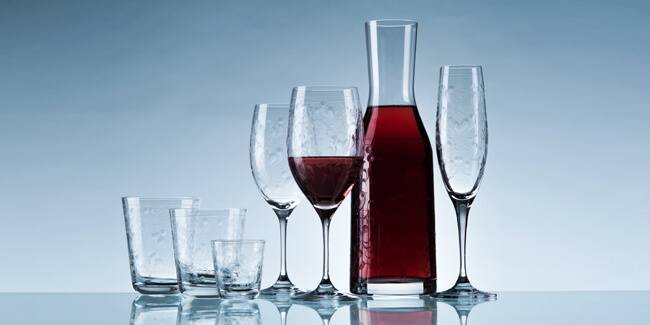 The simplicity of the shape plus hand-cut stems complete the look of a noble, modern crystal glass. The Amelie and Stella series complement each other perfectly – Stella with its gold dots for Champagne, Amelie for wine and water. 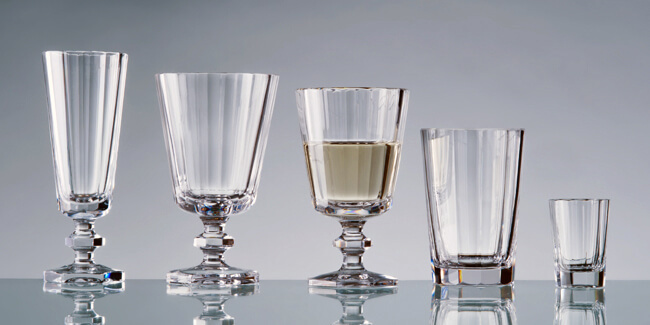 Tumblers and highball glasses of our designs Quadro and Quadrone are made of hand blown heavy lead crystal. Available in six shining colours. Deeply handcut. Straight Bauhaus design in the Tradition of Joh.Oertel. OertelCrystal glass is packed individually in tissue paper and bubble wrap, then put into seperate matching card box. For shipping the cardboxes go into a wellpadded mastercarton.